The 1st Swedish Proteomics Society Symposium on 8 - 9 December, 2002. A two-day international meeting was held in the city of Lund. The 1st SPS meeting 8-9 December, 2002 took place at the Star hotel in Lund. Over 180 researchers from a variety of countries participated in the First Proteomics Meeting arranged by the SPS. An intensive program covering presentations from various fields in Proteomics was accomplished during the two intense days in December. 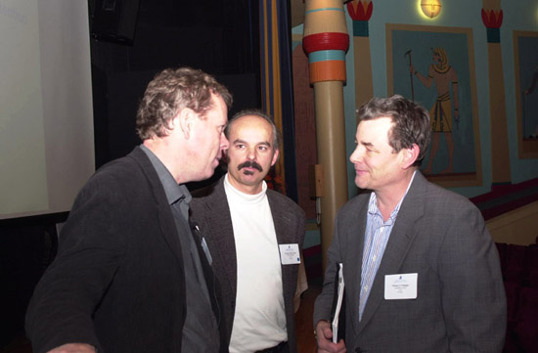 Mathias Uhlen, György Marko-Varga and Tomas Fehniger in a discussion.